It is 9.43 am on Thursday, 20 April 2017, at the bend of a country road. A teenager, Matlhomola Jonas Moshoeu, is lying injured on the ground. He is wearing a blue T-shirt, black sleeveless “Active Vibes” hoodie, grey trousers, and black Adidas takkies. Blood is oozing from his mouth and nose, the right side of his face is against the graded earth, so is his torso; he is in the “prayer position”, his arms stretched out in front of him. The first police officer on the scene finds him lying on the ground, struggling to breathe, and surrounded by a pool of blood. Friends call him “Faki” and he will die from his injuries within a couple of hours, being certified dead at 11:29am. A (probably) graze abrasion from the “midline of the forehead, across the right side, around the right eye and extending to the right cheek” covering an area of 15cm by 13cm. The right eye was also bruised and swollen. 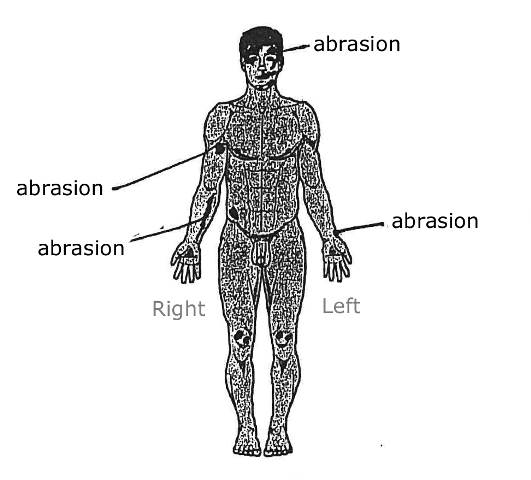 A number of smaller oval abrasions, with bruising, on the left side of the face. A graze abrasion of the inner side of the right forearm covering an area of 18cm by 3cm. An abrasion of 3cm by 2cm on the right armpit. 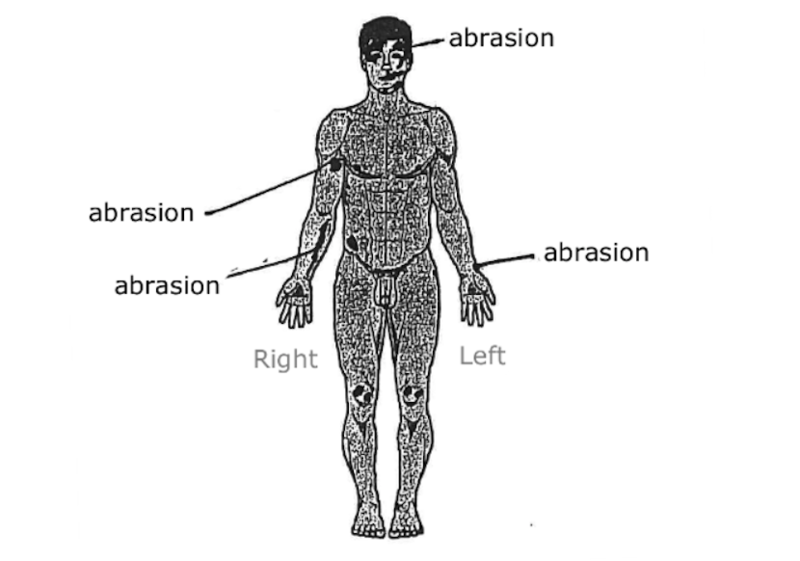 Abrasions on the left upper back near the shoulder; a deep abrasion above the hip on the right (8cm by 4.5cm); and abrasions on both knees. Dr Moorad’s initial opinion, from a purely layman’s point of view, appears to be based upon certain doubtful premises. The first is that while an accidental fall from standing height – say as the result of tripping, slipping or being pushed – does commonly allow sufficient time for the primitive defensive reflex to kick in, the same cannot be said for the fall from a bakkie. This cannot be true. The load bed of a Ford Ranger is 80cm above ground and it takes an object an additional 0.4 seconds to fall that distance. The second, following from this, is that injury patterns consistent with the “primitive defensive” reflex are more likely to be produced by intended rather than unexpected falls from a bakkie. In short, Dr Moorad had to revise her original reasoning – that “it is more probable that the deceased in my opinion fell from the vehicle” unexpectedly because “he did not have time to utilise his protective reflexes” – by admitting that she was not an expert on “reaction times” and by conceding that she would “imagine” that the deceased would have had enough hang time in the air to extend his hands and arms. Defence: So can we agree, Doctor, when you said you expected more such injuries when [the tuck-roll scenario was] put to you…the deceased rolled, the clothing could have had an influence on that? In his response, Adv Du Plessis submitted that Pakisi’s testimony before the court in June 2018 had actually drawn “a straight line through the probability findings of Dr Moorad,” this on the grounds that Pakisi claimed to have seen the child moving through the air with his hands stretched out above his head to break his fall – a classic illustration of the “primitive” defensive reflex. If Dr Moorad had stayed on in court to watch Pakisi’s demonstration, she would have had to concede that such a fall could not account for the perplexing absence of injuries to the wrists and hands observed during her autopsy. In other words, her evidence would have refuted rather than corroborated Pakisi’s version. His conclusion required ignoring the reasonable doubt cast by the fact that the injuries present were consistent with a jump. It meant accepting that the deceased had too little hang time to protect his own head, even though the fall was from a raised elevation; and omitting mention of Dr Moorad’s concession that the injuries were consistent with Moshoeu using his upper arm, rather than his hands, to protect his head. Finally, it required turning a blind eye to the fact that the description given by Pakisi of the alleged throw, in his testimony in June 2018, had delivered the final coup de grâce to Dr Moorad’s initial opinion on the probabilities.